LUCY BURDETTE: I love all of our guests (or we wouldn't have them visit! ), but today's is especially dear to me. Hannah Canter is my darling nephew's bride--we figured he'd choose someone cute and smart as a whip, and boy were we right! Hannah's a Hollywood woman with so many exciting projects in the works, it was hard to narrow down the questions. 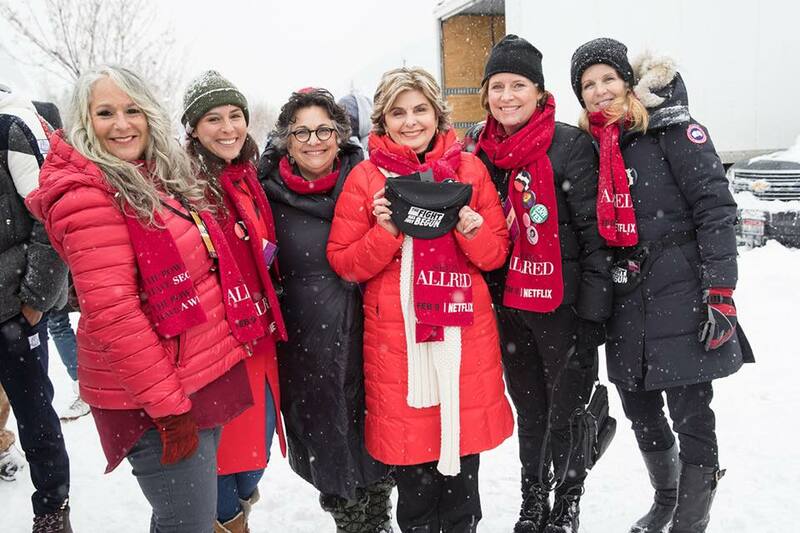 LUCY: You worked on the Netflix's SEEING ALLRED, a documentary about women's rights activist, Gloria Allred, which made its debut at Sundance last month. What a moment for that to happen, with #metoo going viral! Can you tell us a little about making the film, and then the experience at Sundance? HANNAH: The synchronicity of the entire filmmaking experience could not have been better or more profound! In fact, the directors Roberta Grossman and Sophie Sartain approached Gloria three years before Gloria eventually gave her blessing for the documentary, and I find myself constantly thinking about how if she had given the go-ahead when she was originally approached, we would have made an entirely different film – one that still captured her tireless fight for the oppressed but I doubt it would have felt as resonant and relevant as it does in this #metoo era. And when we did eventually start shooting, the Cosby case wouldn’t break for another couple of weeks, an event that we see as the earthquake that brought on the tsunami of #metoo. We feel really lucky and really proud to have been able to capture a soldier on the front line of this movement as it was building. And then, on top of this production journey, to be in the US Documentary Competition at the first post-Weinstein Sundance Film Festival – Gloria happens to also represent a few Weinstein accusers – on the one year anniversary of Trump’s Inauguration and the Women’s March, with Gloria making impassioned remarks at the Park City Rally for Respect… it was kismet. An absolute dream. 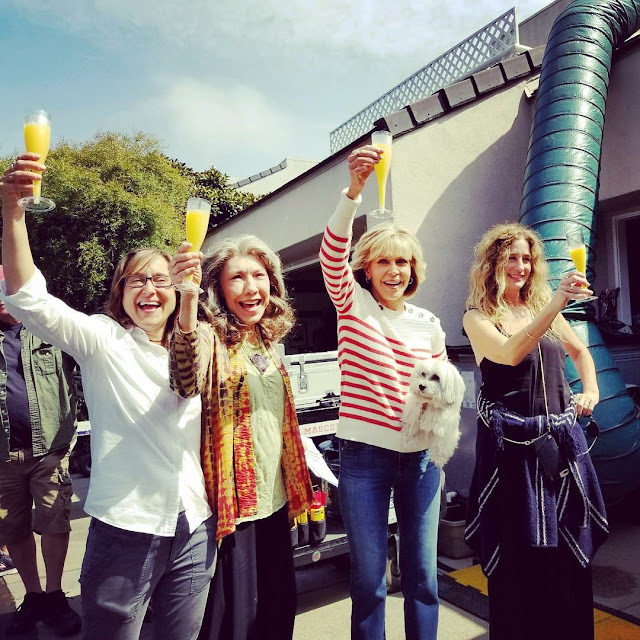 LUCY: The TV show Grace and Frankie launched its fourth season on January 19th and its fifth season was just announced. Congratulations! Tell us a little about your role as this launches and what it's like working with those icons. From there we fleshed out the concept that became GRACE AND FRANKIE, pitched it to Jane and Lily who loved it, and not long after we set it up at Netflix. That whole process was totally surreal for me, a veritable newcomer to producing. I felt like it was the epitome of beginner’s luck. Since then, my role as producer is essentially to maintain the vision for the show throughout all the elements of the creative, always in deference to our Showrunners, Marta Kauffman and Howard J. Morris. In practice, that means everything from giving feedback on stories and scripts, to working with the production departments like art and locations to make and approve creative and budgetary decisions, to working in the cutting room with the editors to execute our internal and studio/network notes. Luckily, between myself, Marta, our colleague Robbie Rowe Tollin, and our incredible crew, we are able to divide and conquer to preserve our sanity, and the creative collaboration is off the charts. It’s hands-down the most fulfilling and inspiring professional experience of my young career, in no small part because of Jane and Lily themselves. They are consummate professionals, always prepared, always on time, always eager to do their best work. They are so immensely talented and elevate everything they touch with their work ethic and their spirit – it makes you feel like you’re a part of something big, something meaningful. And work aside, they still manage – at 78 and 80 years old! – to carve out time to volunteer and organize for causes they hold dear to their hearts, that benefit the victimized and underserved. AND they’re hilariously funny! I have nothing but the utmost respect and admiration for them, and I hope a small fraction of their vitality and amazingness has rubbed off on me over these past couple of years. LUCY: We have both writers and readers who regularly visit our blog. I suspect we'd all be interested in the process of how you choose projects to develop. Where do the ideas come from, and how many books do you look at, and what catches your eye about something that might translate well into film or TV? HANNAH: For us, it’s all about passion. The ladies of Okay Goodnight (myself, Marta Kauffman, Robbie Rowe Tollin, and our two amazing coordinators) are voracious readers, so the way we typically find the books we want to adapt is just by working through the towering stacks of leisure-reading books on our nightstands. When one of us falls madly in love with something and we think it might be a viable adaptation, we stop the presses and make sure everyone at our company gives it a read to see if there’s consensus. An adaptation is really hard work – it requires so much heavy lifting creatively – so whatever the book is has to completely consume us, mind and soul. Being a small and very hands-on production company, we only have the bandwidth to pursue a handful of projects at a time, so we only take on the projects that we feel in our bones, the stories that we can’t imagine not telling, content that has an important and rightful place in the culture at this moment. We tend toward female-driven content, which I don’t think is a coincidence, us being a company of women, but I think it’s also because we see a need in the culture for more stories by and about women. So to answer your question more directly – we are constantly reading fiction, but at any given time we are seriously considering only a few books to adapt. These books would ideally have some dynamic female characters, compelling visual setting or style potential, something about it that feels totally unique or never-before-seen on screen, and the story would have substance and sophistication and its telling would promote our core value of common humanity. LUCY: I could ask a million more things, but here's one last question. You've had a little experience with screenwriting and are probably interested in doing more. what are the challenges of adapting a book to a script? HANNAH: I’d say the biggest challenge I personally faced is how to externalize or dramatize internal thought and character development. For example, if you have an introverted protagonist in a book, the way you get to know her or him on the screen would have to be creatively reconceived in order to achieve the same intimacy with the character. In a book, being let into a character’s thought processes, or an anecdotal memory where its significance is explained to us in its unfolding, or any tangential musings that are never spoken aloud can hold our attention for hours and hours on end. In a visual medium like film or TV, we learn about them more by what they’re doing and saying, unless you employ voice over narration, which is a slippery slope but when used thoughtfully can be very effective. I also think that translating tone provides a special kind of challenge – because so often when we fall in love with a book, what we’re enamored by is so much more than the beats of the story or the arcs of the characters. It’s the unfolding and intertwining of it all, the atmosphere and world building, the unique combination of our synapses that fire off in symphony. And sometimes in order to recreate that intoxicating experience you have to move away from the source material, which can be a painful but necessary step in honoring the book you fell in love with in the first place. Wow, Hannah, your projects [and you] are amazing! I’m curious to know if you find a long-running show like “Grace and Frankie” difficult to keep “fresh” while, at the same time, remaining true to the original vision for the story you wanted to tell when the show was first conceived. Hi Joan. That's a good and difficult question. The short answer is yes - if you ask the writers, they'd say that breaking story arcs for a new season is the most daunting and challenging task they have. But at the same time, I think the show has changed a lot from season one to season five, all while remaining true to the fundamental question of "how do you start your life over at a certain age? ", because Grace and Frankie are our lenses through which we explore that question, their immediate situation drives the stories we tell for them. So in that way, we often look to the characters to dictate what comes next for them. For example, in the first season, they had their lives rocked and were totally devastated by the big changes that befell them. So our task in season one was to get them back on their feet in a way that gave them a taste of their own empowerment. Season two, similarly, was about going from standing on their feet to stepping into their friendship and independence. And on and on, so that slowly we're unburdening these women from the traumas of their past (with many setbacks, of course) and the show and its stories morph with the characters. That's so nice, Beth. Thanks so much for the kind words! So glad Grace and Frankie has been renewed! Love the series, have since it began. I'm still reeling at the 78 and 80 ages. Seems impossible. What great role models. Thank you for the look at the visual side of the creative business. Love it that your inspiration for new projects comes from the TBR pile. So much fascinating information! Thanks for sharing with us today, Hannah, and Lucy for inviting her. Thanks for visiting, Hannah! It must be so much fun to see what a community your productions create, you know? How we can all talk about Grace and Frankie, and it makes us all thoughtful friends. No matter where we are. And the power of a documentary is so intense. I treasure the moments in the edit room when, sometimes, you make one little change, and the whole thing comes together. Congratulations! I hope our paths cross in person someday… And isn’t Lucy amazing? She IS amazing! Hannah, I'm your new biggest fan! I can easily understand how you and Lucy would have bonded. I'm so fascinated by Gloria Allred. It feels like it's not only time for WOMEN but time for OLDER WOMEN to star. Thanks for helping to pave the way. Excellent point, Hallie. I hadn't really registered how much older women are simply absent from popular media until I started seeing shows and movies with people like us in them! Talk about being at the right place and at the right time. And with the right mixture of ideas and opportunity, as well. It gives me the shivers! Grace and Frankie is such a popular show because it resonates so loudly with a demographic that is usually either ignored altogether, or is portrayed in a ludicrously stereotypical way. Their characters are much more like amazing women I know than most older women portrayed in film and TV, and I heartily thank you and your team for creating them. They're strong, intelligent, wry, witty, irascible, and sometimes goofy, but they're so real. And their friendship is brilliantly portrayed, with heart and a loving tenderness. Everyone I know is so taken with the show. And Gloria Allred, too?! Wow, Hannah, you are on fire. More power to you, and to others who are helping to clobber the system that necessitated a Bechdel test. You are my hero. This is a really lovely note, Karen, thank you! We're so proud of both the show and the doc, specifically of their capacity to inspire. As a novelist, I get to do every aspect of the production myself - settings, costume, script... and I play all the parts. Doing the same sort of creative work in a team has always sounded like a challenge to me - how does anyone manage when the vision is realized through consensus rather than one individual's control? There are definitely challenges to creating in a team-oriented environment, but in my opinion there are more benefits. One of the great privileges of being a producer is building the creative team from the ground up, hand selecting the department heads who know more than you could ever know in their specialty and make the work better than you could have imagined. Many of our department heads are women, which might contribute to this harmonious creative experience. But eventhough the process is all about collaboration, at the end of the day the showrunner (Marta Kauffman) and by extension the creative producers (myself and Robbie) are driving the decision making so there's always someone to turn to to make a difficult call. Nothing big is decided without Marta's sign-off. Thanks for your question! Welcome, Hannah! My girl loves "Grace & Frankie." Hank's FORMER agent: I LOVE this book! Charlie McNally is such a terrific heroine. Smart and savvy and successful and cool and funny--and a little vulnerable, but so brave! --and the world is absolutely waiting for an older protagonist. It's perfect. Readers will love Prime Time!! HANK: Oh, fabulous. I'm very excited, too. Hank's FA: Terrific. Um, exactly HOW old is she, though? I mean, in years? HANK: Oh, I made her my age. She's 55. Hank's FA: ::pauses:: Oh. That's too old. Giggle. I just figured out that Gloria Allred is seven months younger than I am. Wonder where she go her plastic work done? Hannah, I too am a huge fan of "Grace & Frankie." Thank you so much for helping make it possible! You are clearly a busy and thriving young woman, but even with all your accomplishments, I suspect you have unplumbed depths. One sentence from your last response really grabbed me -- it was like poetry! "It’s the unfolding and intertwining of it all, the atmosphere and world building, the unique combination of our synapses that fire off in symphony." I hope that anyone who writes like that will have more writing in her future!! Congratulations, Hannah! What an amazing thing you are doing. 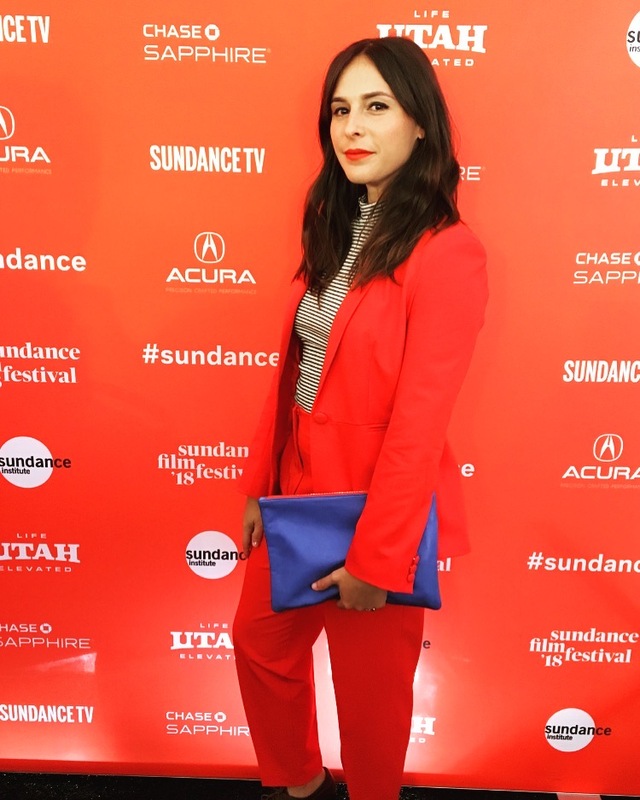 Our next door neighbor's daughter is Maggie Kiley, another Hollywood woman trying so hard to be seen as a serious professional, a director as well as wife and mother, so many hats to wear. Gloria Allred is one of my heroes, too. Hannah, wow, what a treat to wake up this morning find you here on JRW! Not only am I a fan of the work you do, I'm fascinated by how you do it. I've had a couple of options on my series so have worked a little with producers and show runners. It's so interesting to see how a creative team can bring together a vision--and in a way that is unique to that team. Congratulations on your success, and looking forward to many more of your projects!! Very interesting. Thanks for the interview. I've really come to realize that the internal conflicts and changes are hard to translate to the screen. I've actually noticed changes in movies to flesh this out, and they've made for better movies as a result. But that process is very tricky. Thank you so very much for Grace and Frankie!!! May we all be fortunate to be at the top of our game at their ages. Hannah- What a fabulous interview! I just adore Grace and Frankie and LOVED the concept from the get go! Bravo! As for your work with Seeing Allred, WOW! It must have been life-changing. Thanks so much for sharing it with us. Looking forward to seeing what you do in the future!